One of the biggest pet peeves of being a drummer is to deal with poorly made charts. For some strange reason, musicians tend to neglect drum charts. I believe it has to do with the lack of rhythmic material covered in most educational programs around the world. So many musicians don’t know how to notate for drums. If you think a drummer is going to perform his or her best with so little information and presented in such a poor fashion, you don’t know what the function of a drummer in a small jazz ensemble is. A drummer, like the rest of the members of the band, needs the most information possible in their chart, so they have things to draw on and grab from. They need to have more options to choose from when orchestrating and deciding what kind of pattern/feel they want to play. 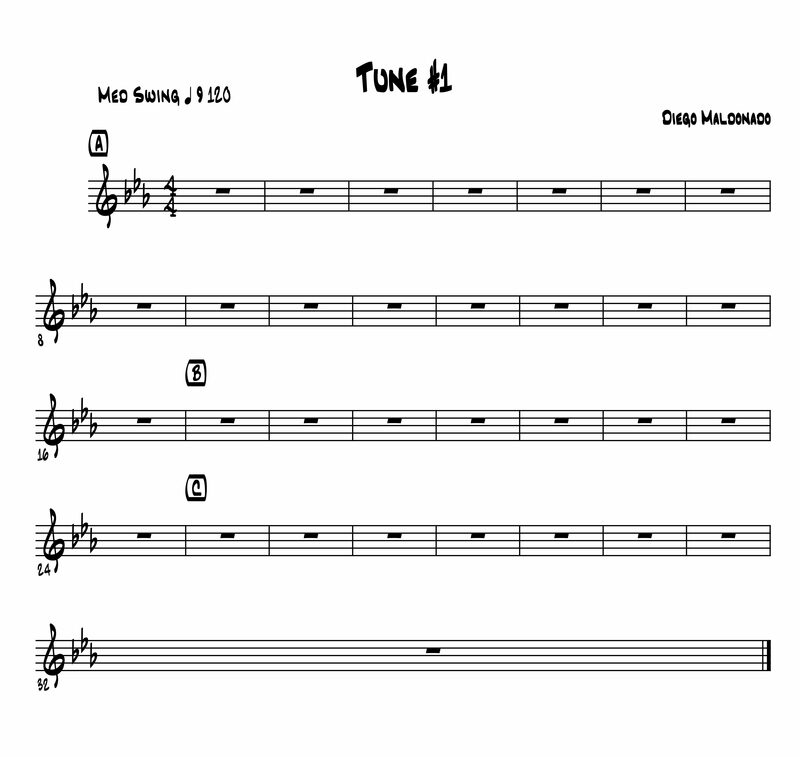 In this article, I’m going to share with you different ways to create drum charts for small ensembles for your original tunes or jazz standard arrangements. Note that I’m specific here, I’m talking about small ensembles only. And that is because the function of the drummer, in general, is different in a small group than in a big band. In a big band, with 17 or more instruments, the drummer can’t have everything on their chart. And the role of the drummer is more restricted. In a large ensemble, the drummer has to stick to her position as timekeeper and make sure she holds the entire band together in one tempo and feel. On the other hand, when playing in a small group, the role of the drummer opens up. 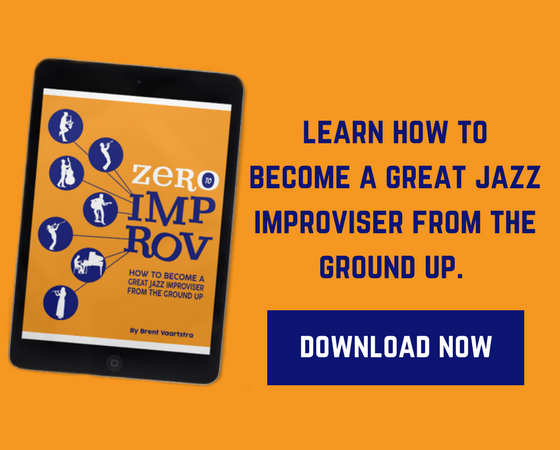 Drummers can be more inventive, participate more in the improvisation and be more flexible with tempo, form, and feel. This is when we need more information on our charts. When I’m talking about small groups, I’m talking about trios, quartets, up to maybe a sextet. In those small settings information is more limited and can be added to the drum chart. So, what should we be writing in our drum charts? Melody: Having the melody on the chart is vital. Good drummers are going to be capable of adapting their comping to fit the tune. Chords: Providing chords is always helpful. If you’re playing with trained drummers, it is likely they can understand the changes. Their playing is going to sound more informed, and they are going to underline the form better. Also, having the changes on the paper gives the drummer the harmonic rhythm, which is essential for deciding what kind of feel or vibe to play. Rhythmic Cues (if the song has them): If the song has them, make sure you write them down. Usually, they go on top of the system, or sometimes you can write them below. But make sure they are clear, so it is easy for the drummer to read. Arrange system in even number of bars. Or if you have an odd phrase make it clear in one system. For instance, if the tune has a 5 bars phrase, arrange it into one 5 bars system or make it 3 bars in one and 2 in the next one. If it is laid out in that manner it is more likely the drummer is going to interpret that as a 5 bar phrase and not a 4+1 bar phrase. Try, as much as possible, to place the beginning of each section as the first bar of the system. Place all the indications where they are easy to see. Avoid overlapping text or chords. Make logical page breaks. Remember the drummer needs to play with both hands and feet all the time. Make it as easy as possible for them to turn the page. I’m going to share an excerpt of “the drum chart/lead sheet” of one of my tunes as an example on how to present your music to drummers and musicians in general. As you will notice, all of the elements listed above are present in this chart. The melody is there and has accents on the notes I want the drummer to take into consideration when comping. 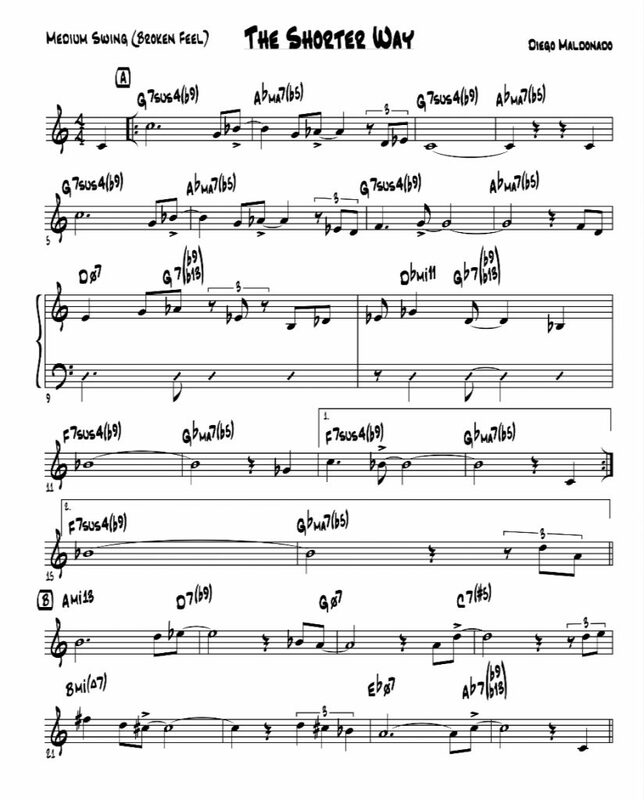 Chords are written with a big and clear font and are easy to read. Rhythmic cues in the third system are on a grand staff using the lower part. I decided to write them there because my chords are big and I don’t want any overlapping or confusion. Also, notice the layout. I wanted to make clear to the drummer and rest of the band that the A section is 2 (4 bars) phrases, 1 (2 bars) phrase, and 1 (4 bars) phrase. So I laid it out that way. Also, notice the second ending. I used the entire system for it to avoid starting the B section in the middle of the system. As I said before, always try to begin new sections on a different system. It is easier to follow and read. Notice as well that all indications are well positioned with big fonts which make them easy to read. There are no overlappings of any kind. Finally, if you are serious about composing and arranging, I would highly recommend you learn how to use any of the music notation software available in the market. 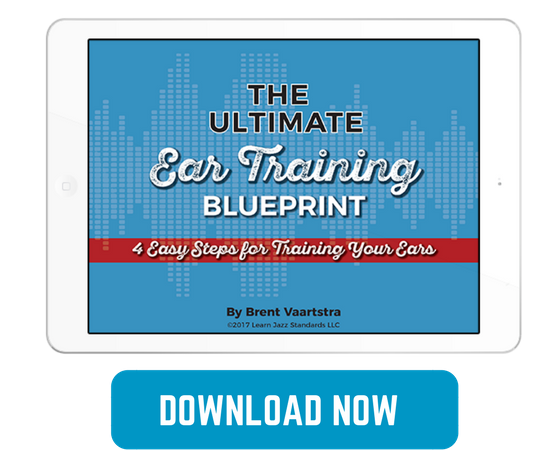 It’s going to make a huge difference in how you present your music to other bandmates, and it’s going to save you a lot of time and stress. Hope this was helpful, and remember to share your comments and thoughts below in the comment section. Also, you can reach me at any of my social media profiles (INSTAGRAM or FACEBOOK) if you wish to say “hi” or ask any question about the article. I'm not clear as to what "System" means in the article. Can you explain it to this novice? System refers to a single line of music, left-to-right, regardless of the number of instruments. In the leadsheet example, there is a single staff comprising each system. Sometimes you'll have several instruments lined up vertically – trumpet, piano, bass, etc. – synced vertically, and flowing left-to-right. One swipe across the page is a system, in that case one composed of several instruments. Thanks for sharing the great answer Steve! Very well explained. This made clear how important is to write the charts clearly for the drummer. Glad you found this helpful Antonio! Special thanks to our drum expert, Diego.